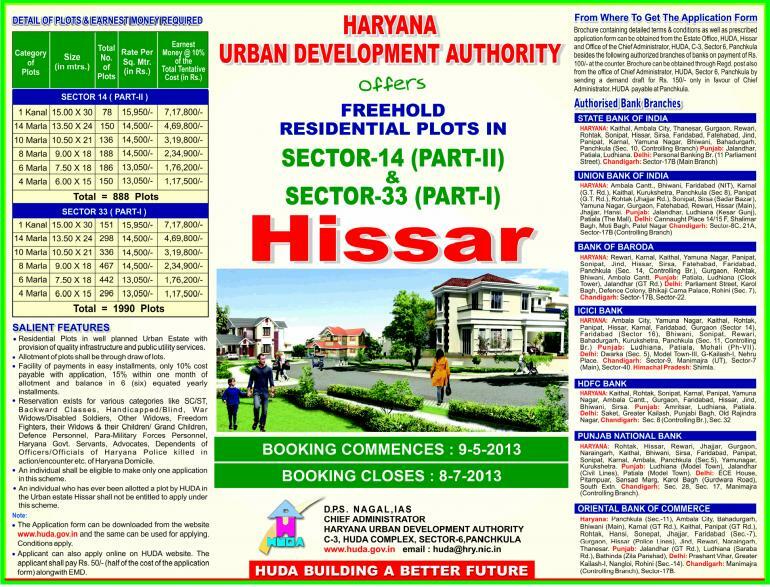 The Haryana Urban Development Authority (HUDA), INDIA is going to draw 16085 plots in residential area of Haryana in all 22 Districts. Application Process will start soon. According to the sources, in Haryana this process will be completed in 4 quarters. Dadri , For Sector No. -08, Total Plots : 320. Dadri , For Sector No.09 , Total Plots : 455. Hisar , For Sector No. 33 part-1, Total Plots : 2190 . Rewari , For Sector No. 05 , Total Plots : 223 . Rewari , For Sector No. 07 , Total Plots :475 . Karnal , For Sector No. 32 , Total Plots : 461 . Karnal , For Sector No. 33 , Total Plots : 1056. Tarawadi , For Sector No. 01 , Total Plots : 763 . Sonepat , For Sector No.05 , Total Plots : 254 . Sonepat , For Sector No. 19, Total Plots : 107. Faridabad , For Sector No. 75 , Total Plots : 349. Faridabad , For Sector No. 80 , Total Plots : 595. Palwal , For Sector No. 12 , Total Plots : 489. Mahendergarh , For Sector No. 9 & 10 , Total Plots :242. Agroha, For Sector No. 06 , Total Plots : 854. Bahadurgarh, For Sector No. 10 , Total Plots : 378. Fatehabad, For Sector No. 09 , Total Plots : 1831 . Jind, For Sector No. 09, Total Plots : 293. Jagadhari , For Sector No. 22 , Total Plots :315 . Jagadhari , For Sector No. 24 , Total Plots :841 . 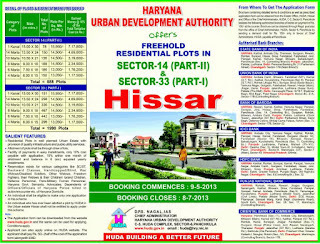 Hisar, For Sector No. 14 part-2 , Total Plots :997. Fatehabad , For Sector No.11, Total Plots : 949. Safidon, For Sector No. 07 , Total Plots :398. Safidon, For Sector No. 08 , Total Plots :803. Safidon, For Sector No. 09 , Total Plots :408.